Sig Sauer outfitted its 3-9x40 WHISKEY3 Riflescope with quality optics and a HellFire QuadPlex reticle. The optics feature lenses that are crafted from Low-Dispersion (LD) glass to provide true color and to maximize resolution of images. Coated with the SpectraCoat full multi-coatings, the lenses offer high transmission throughout the entire visible spectrum, delivering bright and crisp images. To ensure that the image quality is not degraded by external environmental conditions and elements, the optics are protected by the LensArmor coatings against abrasions and scratching. Another highlight of this riflescope is its illuminated QuadPlex reticle, which is located in the 2nd focal plane and offers a brilliant red center illumination. It features four medium posts, a fine crosshair, and uses a fiber-optic technology to finely control illumination of the bright red center dot. To endure the most outdoor conditions, the 1" maintube is made from a durable and lightweight aluminum alloy and provides a waterproof and fogproof performance. The windage and elevation knobs are knurled for slip-free operation and offer 1/2 MOA adjustment ranges with 90 MOA increments. Also available with this riflescope is the Sig Ballistic Turret Dial (SBT), which features a precision tactical finger-operated knob. The Sig Ballistic Turret (SBT) is a custom laser-etched elevation dial that uses your bullet specifications, ballistic coefficient, muzzle velocity, elevation, and other environmental factors for the correct bullet drop compensation and pinpoint accuracy. All other dials and rings are also enhanced with knurling for a slip-free grip. 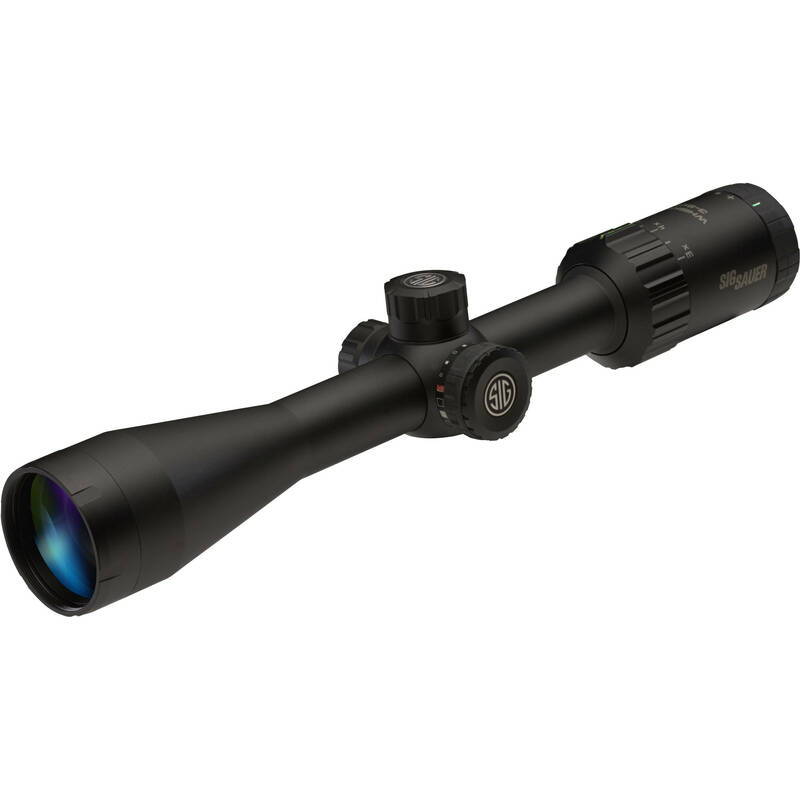 3-9x40 WHISKEY3 Riflescope (HellFire QuadPlex Reticle, Matte Black) is rated 5.0 out of 5 by 2. Rated 5 out of 5 by Lil Smoke from Great for Black Bear Just got back from bear hunting in Northern Minnesota. I shot a nice bear close to sunset. Typical bear scenario, bear appears, comes out of nowhere, woods were getting dark. This scope is very clear and lets in lots of light. View was sharper and brighter than my eyes could see without it. The illuminated fire dot crosshairs was the icing on the cake for perfect precise shot placement. I now have a 305 lb. cinnamon colored trophy black bear. Excellent scope for black bear hunting.